Crack is unique because it offers a strong cocaine experience in small, low-priced packages. In the United States, crack cocaine is often sold in small, inexpensive dosage units frequently known as .nickels. or .nickel rocks. (referring to the price of $5.00), and also .dimes. or .dime rocks. ($10.00) and sometimes as .twenties. or .solids,. and .forties.. The quantity provided by such a purchase varies depending upon many factors, such as local availability, which is affected by geographic location. A twenty may yield a quarter gram or half gram on average, yielding 30 minutes to an hour of effect if hits are taken every few minutes. 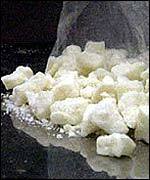 After the $20 or $40 mark, crack and powder cocaine are sold in grams or fractions of ounces. Many inner-city addicts with a regular dealer will .work a corner,. taking money from anyone who wants crack, making a buy from the dealer, then delivering part of the product while keeping some for themselves. Smoking freebase or crack cocaine is most often accomplished using a pipe made from a small glass tube about one quarter-inch (about 6 mm) in diameter and up to several inches long. These are sometimes called "straight shooters," readily available in convenience stores or smoke shops. They will sometimes contain a small paper flower and are promoted as a romantic gift. Buyers usually ask for a "rose" or a "flower." An alternate method is to use a small length of a radio antenna or similar metal tube. To avoid burning the user's fingers and lips on the metal pipe, a small piece of paper or cardboard (such as a piece torn from a matchbook cover) is wrapped around one end of the pipe and held in place with either a rubber band or a piece of adhesive tape.